To many observers, the 2008 elections augured the end of the conservative era in American politics. Buoyed by a reaction against Great Society liberalism and the Republican Party's shrewd race-based "Southern Strategy, " the modern conservative movement first enjoyed success in the late 1960s. By the 1980s, the movement had captured the White House. And in the early 2000s conservatives scaled the summit as a conservative true believer, George W. Bush, won two presidential elections - and the Republican Party captured both houses of Congress. But currently they have few credible presidential prospects. Today's most recognizable Republican, Sarah Palin, is regarded by most of the electorate as an ill-informed extremist. And the Democrats have commanding majorities in both the Senate and the House. What happened? 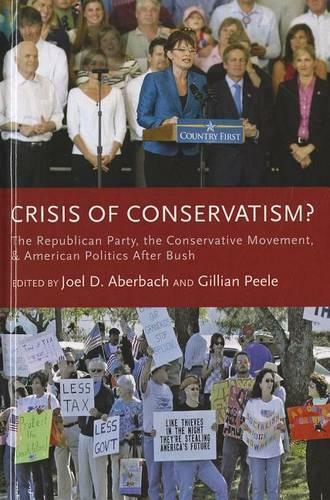 The Crisis of Conservatism gathers a broad range of leading scholars of conservatism to assess the current state of the movement and where it is most likely headed in the near future. Featuring both empirical essays that analyze the reasons for the movement's current parlous state and more normative essays that offer new directions for the movement, the book is a comprehensive account of contemporary conservatism at its nadir. Throughout, the editors and the contributors focus on three issues. The first is the extent to which the terrain of American politics remains favorable to the Republican Party and conservative causes, notwithstanding the Obama victory of 2008. The second is the strategic ability of the Republicans and the wider conservative movement to renew their strength after the shattering experience of the past few years. The third issue they focus on is the extent to which conservative attitudes and values, policy preferences and impulses of the period since 1980 have in fact created a new consensus, one which the Obama administration will find it difficult to escape, regardless of his "change " rhetoric. They conclude that if conservatism does in fact remain a powerful shaper of the electorate's values, then the American right could very well reconfigure itself and begin the journey back to credibility and power.